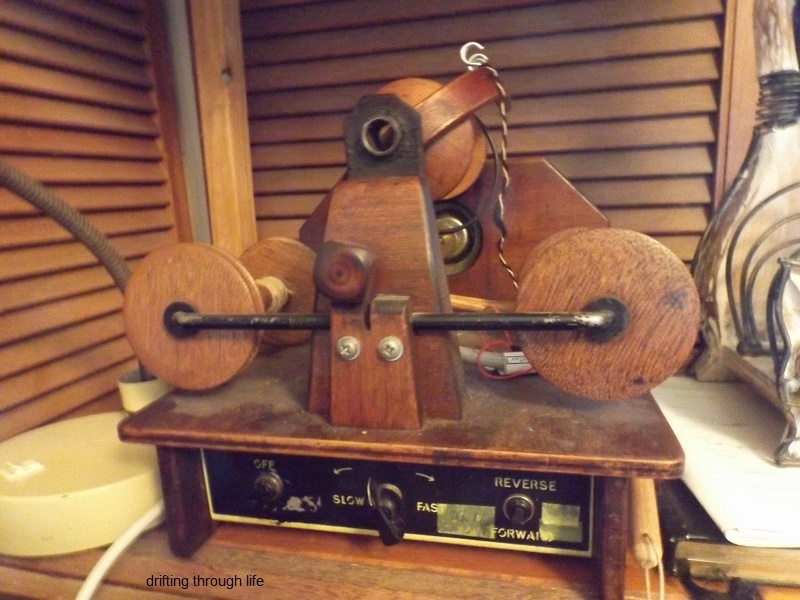 V tells me this is an electric spinning wheel, which runs very fast, but she hasn't used it in many years, having too much arthritis now to spin with any comfort. 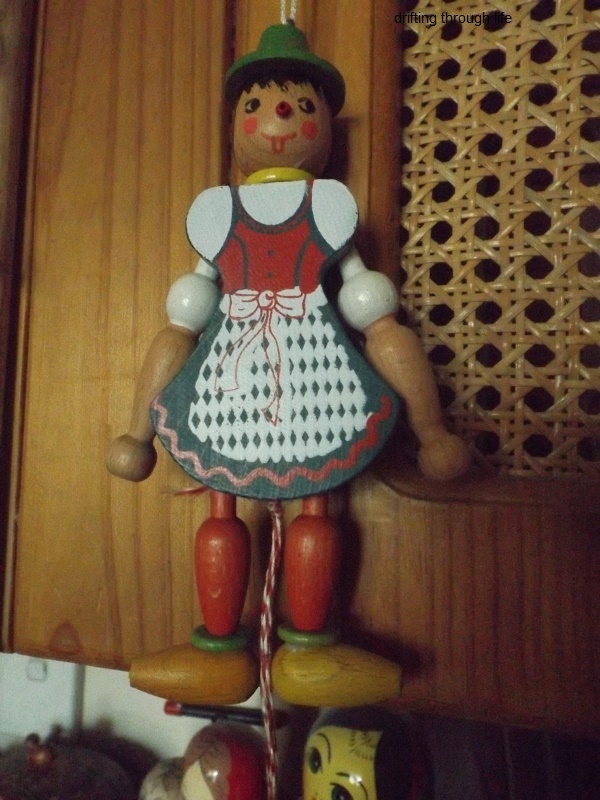 V also has a fondness for puppets and made several of her own when she was younger. but not these two pictured. 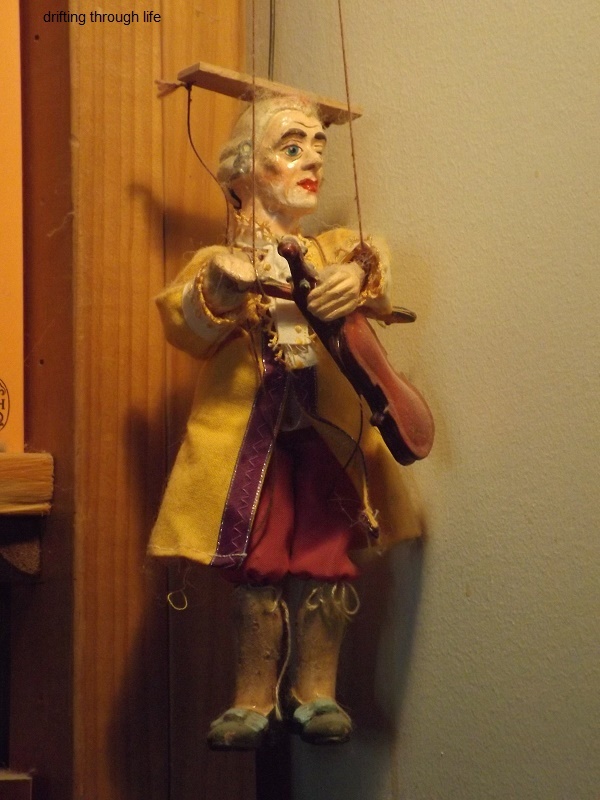 I have seen photos of V with her handmade string puppets, she used to put on puppet shows. 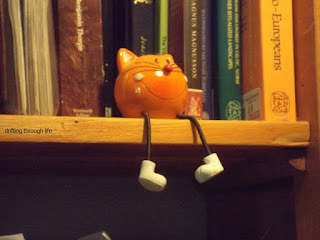 and V loves cats, real and toy, her collection of stuffed Garfields is quite a sight. Your friend is a very talented person. 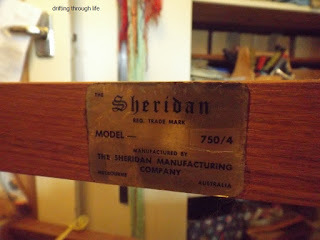 I have so much admiration for people who do handmade items that we are all so accustomed to being factory made nowadays. As an uncreative, non-handy, crafty person I'm always in awe. 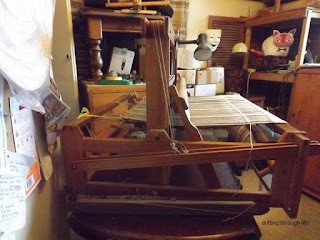 Grace; V learned all these things when she was young.At 83 now, many don't get done anymore, but she continues with the weaving and does a little knitting too, but only with wool or silk and wool blends, having a hearty dislike for artificial yarns and fabrics. So cool! I've never seen a loom, and never thought about where puppets come from. That will be a pretty poncho. Val; Joanne who sometimes comments here also does weaving and has shown her loom on her blog. Many puppets these days are machine made, but V made her own in her twenties and did puppet shows. The poncho is finished now and being thick it is quite heavy to wear, V allowed me to try it. 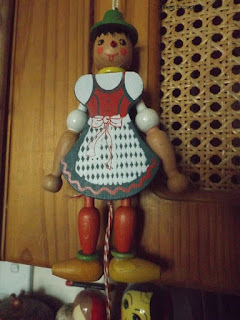 She is much taller than me though and used to wearing such thick heavy clothing, being born and raised in Switzerland. That poncho is going to be gorgeous!! fishducky; it is gorgeous, another will soon be underway, in lighter weight yarn in shades of purple and greys on a mist green warp. She is hugely talented. Love those colours. Love that it is all natural. Elephant's Child; hugely talented might be an understatement as V also paints and draws. Most of the wall hangings and rugs in her flat were made by her, also the large colourful rug on her floor and the many small mats of alpaca hair that her cats like to lie on. I think V is very clever. 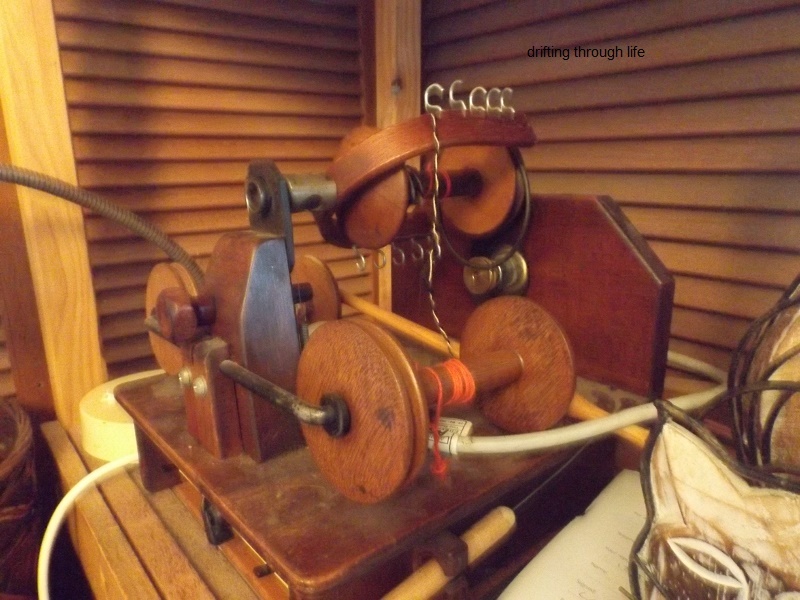 I always find looms fascinating. Never mind the clever people who invented computers, how clever was the person who invented the loom. 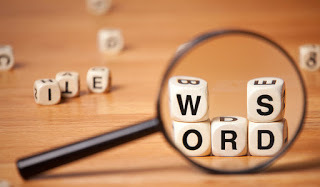 Andrew; I agree she is very clever, also agree with the invention of the loom being one of man's greatest achievements, along with the wheel and baking. She really is talented. 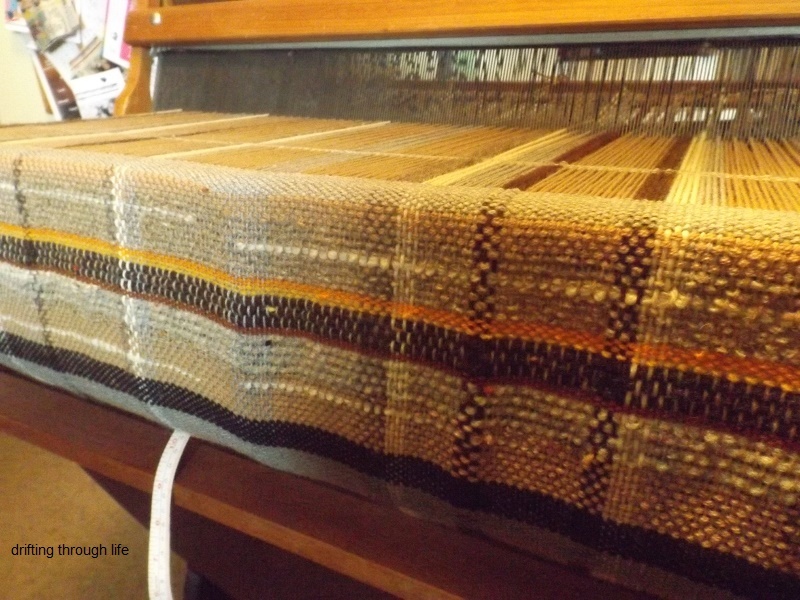 It must feel great to create such beautiful fabric on the loom. And those puppets?? Wow. Thanks for the tour. Pretty little loom. I used to have that wheel. I think it was a Roberta. Arkansas Patti; I'm surprised at the colour combinations V comes up with and she tells me she just looks at what nature does and copies. 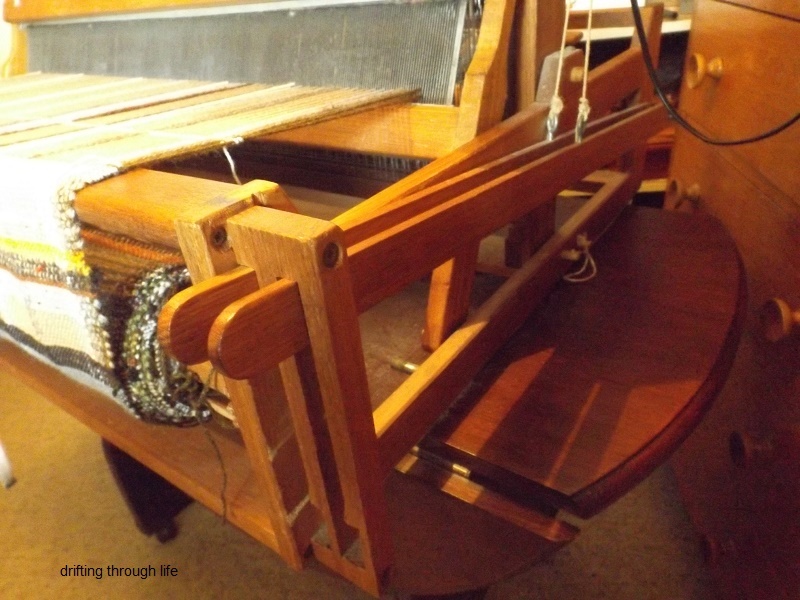 Joanne; it is a pretty little loom and she showed me on day how she does a couple of rows of work, throwing the shuttle to and fro. I'm not at all crafty, so I don't think I could learn, but I wouldn't mind helping one day if V should ask me. Weaving is a great talent, thank you for showing us her work in progress. Around midnight our time, which is probably when your day is mostly over, my Sunday Selections will be here. 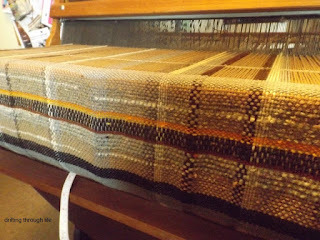 messymimi; if I had known weaving classes were available when I was much younger, I would have taken some for sure, if only to be able to make mats and wall hangings. I'll see your Sunday Selections tomorrow afternoon, I have to be out all morning. 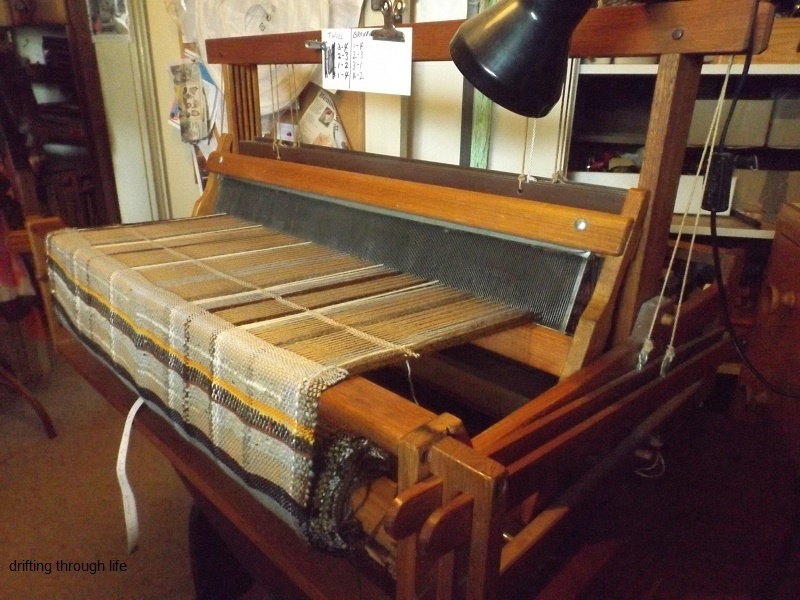 My sister has two looms where she weaves rag rugs. All sizes, all colors. 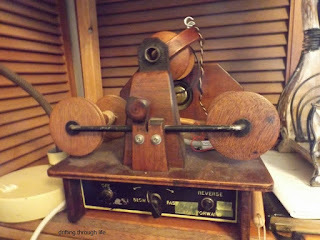 She moved a couple of weeks ago and has had to redo her warf threads which is quite a job, she tells me. Peace Thyme; I'm told the warp threads take a long time to set up and must be just right. Beyond my capabilities I think, now that I have some arthritis in my fingers and a shoulders. How wonderful. Beautiful work she is producing. Lee; it is beautiful work, you should see the large mat on her bedroom floor. I don't have room for a loom either, lucky V has a two bedroom flat and the second small bedroom is where all the weaving takes place. Lola is making good progress, the sore spot is healing and she isn't scratching at all now. It is thrilling to see this art continuing. Beautiful work.I cannot imagine making those puppets/marionettes. Susan Kane; I'm happy to see this art continuing too, even if I'm not participating. I've discovered there is a Weavers&Spinners Guild in my city too, but way across town, otherwise I might ask to watch now and again. 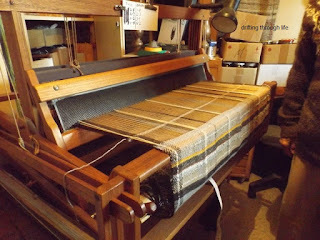 I'm fond of home weaving you get great results and you have something that not seen anywhere else in the world. Merle; I like the idea of home weaving and yes, unique clothes and rugs are a great thing to have, but I'm also sure I couldn't do it. Selecting yarns and devising patterns is not something I'm good at. Fascinating! What a talented lady. 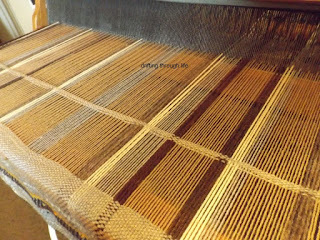 That material on the loom is lovely. Glad to read your reply to a comment in which you said Lola is getting better.